(In-flight, August 2008) The easy pun here is that Flawless isn’t, but it’s actually more difficult than one would expect to find explicit flaws with this heist film. 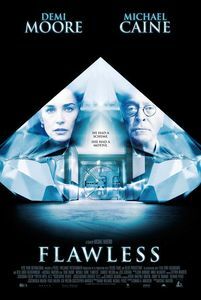 The most one can say is that the film is duller than it ought to be, what with a look at swinging sixties London in which a diamond company executive (Demi Moore, back after a lengthy absence) conspires with a knowledgeable janitor (Michael Caine, as good as ever) to rob a few diamonds off the vaults of their mutual employer. Alas, the action is all low-key, and the period details never seem to cohere. Moore herself is bland in a role that could have been handled by anyone else, while the film itself never has any fun at all. While the plot developments are enough to hold anyone’s attention, there isn’t much to process once the credits roll. At best, it’s a competent heist thriller that pays attention to its characters and satisfies the indulgent viewer. But it’s hard to avoid feeling that it could have been much better. 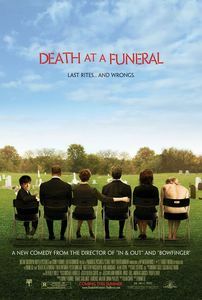 (On DVD, August 2008) This is not going to be a long review: Amiable funeral farce in which an ensemble of British-accented actors deal with a would-be blackmailer and accidental drug trips. Despite the language and the seemingly-dark theme, this is an innocuous and friendly film that mixes gross laughs with more emotionally complex moments to produce a hard-to-dislike comedy film. The actors are fine (with Alan Tudyk a highlight), the direction is unobtrusive and the script is a little wonder of weaving subplots. Not a bad choice for a comfortable movie night. The DVD contains a director’s audio commentary that’s impossible to dislike. 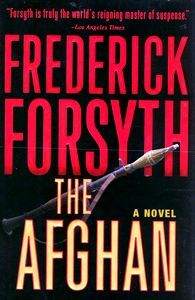 In an industry when a decade-long career is enough to earn writers the “veteran” qualifier, it’s sobering to realize that Frederick Forsyth has been a best-selling author for longer than many of his readers (including this one) have been alive. Since 1971’s The Day of the Jackal (which was adapted as a movie twice), Forsyth has been a reliable thriller writer, churning out complex but intensely readable novels every few years. While his best-selling glory days of the seventies and early eighties have evaporated, Forsyth has remained an elder statesmen of genre fiction, with a sideline in cranky conservative commentary for a variety of outlets. As such, he’s entitled to a bit of slack in discussing The Afghan. It’s the latest Forsyth, for goodness’ sake. So what if it turns out to be a paranoid tract that spends more time describing how things happen than dramatizing the action? It’s still a fascinating book, one that hints at the indulgences that professional authors with a long track record can enjoy if it suits their fancy. A laconic plot summary doesn’t do justice to the book. Evil Al-Quaeda plot; heroic British operative; desperate infiltration mission. You can probably guess where it goes from there, and you wouldn’t be wrong: there’s been scores of lone-wolf-against-terrorists stories in the past decades, and The Afghan is certainly one of them. But as most reviewers understand, it’s all in the execution. For instance, one thing that Forsyth does extremely well is to write a thriller according to the right-wing understanding of the world: Al-Quaeda is a real force, they actively plot against Western interests, and they’ve got both ruthlessness and a ton of money. Against them, government operatives with steely gazes and absolute moral authority are justified in using every mean necessary to protect the ignorant sheep against the gathering threat. Sacrifice, honor and shooting terrorists in the head: those are the values that Forsyth hold self-evident. Surprisingly, it works pretty well even for readers who don’t share the same world-view: Once he established the deeply paranoid world in which his characters live, the rest takes care of itself. But where Forsyth really distinguishes himself with this novel is the intentionally didactic tone he chooses to use. I’m not talking about Tom-Clancyesque exposition in the middle of the action (although, to be fair, Forsyth was expositioning at length a dozen years before Clancy), but almost constant technical explanations, uninterrupted by the niceties of dialogue, for pages on end. The impact is more profound than you may think: Not only does the steady flow of specialized information lend an almost-unimpeachable credibility to the tale (the staggering amount of research this novel must have required…), it also gives it a Voice-of-God quality that distracts from the novel’s most egregious shortcomings. Problems such as simple plotting (Hero is trained and sent somewhere, where he stops the attack. The End. ), thin characters and unforgivable coincidences —from a bin Laden cameo to a preposterously unlucky plane crash. More fundamentally, the ultra-omniscient narration also paints itself in corners when comes the time to withhold information from the reader in order to create suspense. While Forsyth still manages a few outstanding scenes, such as the finale or the very cool “He’s in Canada, sir. / Take the shot, Sergeant.” exchange [P.295], they’re still held at arm’s length from the reader thanks to the dispassionate, matter-of-fact narration. But Forsyth’s greatest trick may be to make this narration the centerpiece of the book, the unusual quirk that comes to attract all attention notwithstanding the problems with the rest of the book. Now that’s what an old wizened veteran can do when he”s indulging himself.